Josh Blaylock joins the creators of your favorite Devil’s Due comics, one book at a time, discussing the craft behind each title’s creation, and anything else going on in their lives. Get an inside glimpse into the day to day of the creators, learn what makes them tick, and talk until the conversations inevitably turn to discussing beer, their pets, or someone’s mom yells at them to come up from the basement for dinner. ​Subscribe and tune in for the next Comic Book Commentary LIVE on the internet! Submit a question for Josh or another creator for the next CBC! 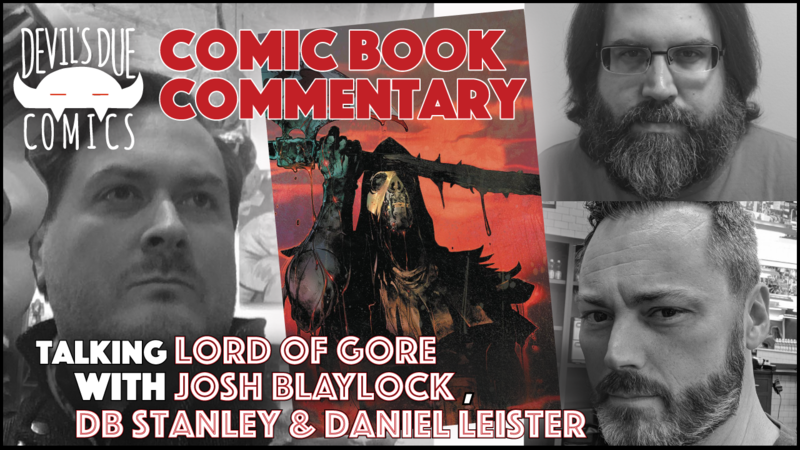 Join Josh Blaylock and Lord of Gore creators DB Stanley and Daniel Leister in December for the next Comic Book Commentary. Exact date and time to be announced. The first ever Comic Book Commentary featuring Josh Blaylock and Little Girl creator Pat Shand. Listen to the two creators talk nerdy and discuss what they have in store for the upcoming Mercy Sparx series. Aside from this being a video where you get to stare into Blaylock's and Shand's eyes, there's a sneak peek at the new Mercy Sparx art.